Science, technology and engineering have always been key themes for Farm Urban, as two of us come from a PhD background in biosciences. We like to think of ourselves as a renaissance team though and have always had a foot in the arts; Adam from Farm Urban and his partner Danielle have worked as artists and put on a number of exhibitions in Liverpool over the years. We were delighted to be invited to join in the UK launch of creativity charity STEAMco, celebrating creativity in education and bringing together the disciplines of Science, Technology, Engineering, Maths and Arts. STEAM co drew their initial inspiration from fellow Scouser Ken Robinson’s TED talk, so were instantly in our good books. Their aim is to bring excitement and creativity into the teaching of the more technical subjects, something that is often lacking, but needed more than ever in our increasingly technological society. 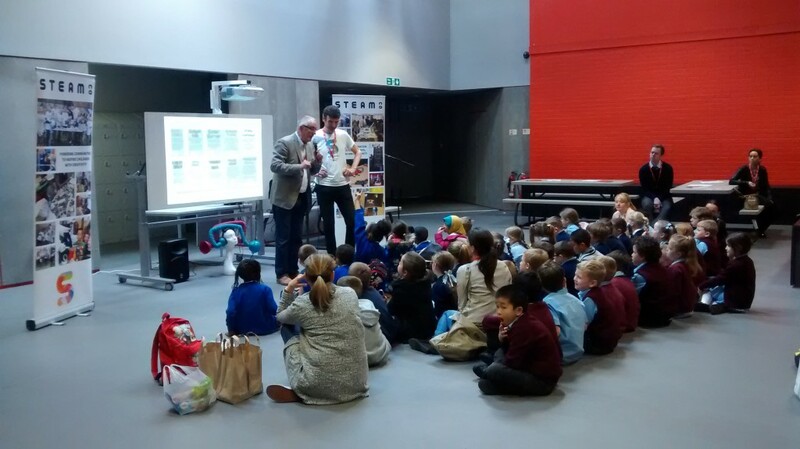 STEAMco powers communities of parents, artists, teachers and business to inspire children with creativity by organising events where school pupils are introduced to everything from coding to rocket science (with real, flying, paper rockets) in a fun and action-packed day. 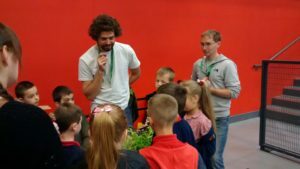 They decided to hold their inaugural meeting in Liverpool at the UTC with an event for around 70 seven-year-olds from ten primary schools in the Merseyside area. 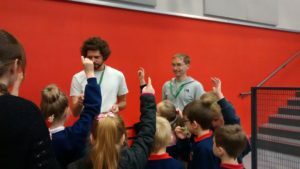 It began with some inspirational talks by Nick Corsten from STEAMco, cognitive psychologist Professor Guy Claxton and inventor Dominic Wilcox; talks aimed at the seven-year-olds, but that proved inspirational to us. The day itself was an assault on the senses with bangs, whizzes, splashes and the whirs of motors, as our young creatives learned how to fire a paper rocket with compressed gas, program a wheeled robot to whirl around the floor and print their own newspaper. 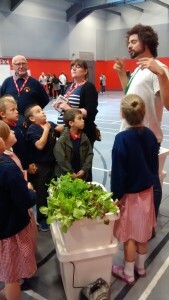 We weren’t sure how the kids would take to the more gentle science of aquaponics, but luckily our trusty goldfish and edible greenery were enough to pique their interest and bring them over. It was a little daunting to be confronted by the expectant and energetic faces of a gaggle of seven year olds, but we found their enthusiasm infectious. 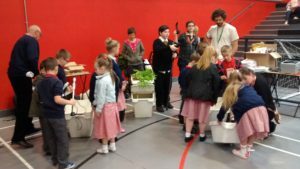 We first took each group through one of the small, affordable, DIY home aquaponics systems we’ve designed (premiered at the Food for Real Festival a few weeks back). 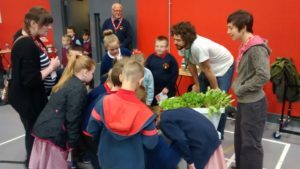 Paul explained the principles behind aquaponics, and how fish poo (Yeeerrgh!) could be turned into food for plants. We then split the kids into two groups and gave them all of the components required to build a system (but no instructions – you’ll be familiar with this if you’ve ever built flat-pack furniture as the instructions are so cryptic as to be useless…), and set them off in a race against each other to put it together. When we designed the system we were hoping to come up with something that someone with minimal technical skills could put together. Based on the speed with which the kids put the systems together without instructions, it looks like we’ve succeeded, as it took all the groups less then fifteen minutes to put it together. The only slight hiccup was the filling of the growing container with the clay media that the plants grow in. A dozen pairs of excitable tiny hands and thousands of small clay balls meant we spent the most of the rest of the event rushing around with a dustpan and brush. 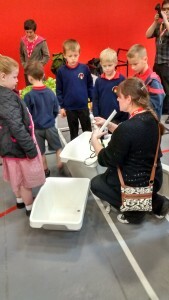 The event was a huge success, and it was very encouraging for us to see how enthusiastic and engaged the kids were by aquaponics, and how quickly they grasped the principles behind it.